OTTAWA, CANADA - Eurocom Corporation has released new notebook models exceeding the specifications of Intel® CentrinoTM technology. Eurocom Centrino based notebooks in addition to long battery life and integrated wireless networking are equipped with extra features such as built-in PC camera for video conferencing, Bluetooth for personal wireless networking, DVD-burner for Mobile DVD Burning and optional GPRS module for mobile GPRS computing over the cellular phone lines. The Intel® CentrinoTM mobile technology brand, which includes integrated wireless LAN capability, enables extended battery life plus the ability to fit into thinner and lighter notebook PC form factors. Three components - the Intel® Pentium® M processor, Intel® 855 Chipset Family, and Intel® PRO/Wireless 2100 network connection empower a whole new generation of notebooks to deliver reliability to computer users whenever and wherever they need it. A combination of cutting edge notebook specific processor design and Wi-Fi capabilities, Intel Centrino mobile technology offers notebook capabilities designed specifically for the mobile world. - and optional integrated GPRS module for mobile GPRS computing over the cellular phone networks. The GPRS (General Packet Radio Service) technology gives access to the internet and email using a notebook computer via the cellular telephone network. Always on, it allows companies and individual users to view web pages, send and receive email, share images and files, access company database, as well as do mobile printing, faxing, CD-burning, video conferencing, presentations or web training. Users can get information on the road, respond to cutomers faster, spend more time with clients, serve customers in new ways, process information in real time, improve client satisfaction, reduce support staff costs, be more productive, and deliver customized presentations or legal contracts "on-the go". The Mobile GPRS computing is going to change the way mobile users will access the internet all over the world. Eurocom currently offers the M350C and M375C Milano series notebooks with Centrino. 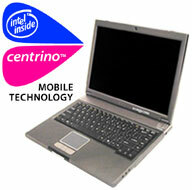 The Centrino versions of future models such as EUROCOM D470C Impressa and EUROCOM T200V TabletPC are to be released soon. The EUROCOM Milano notebook is a perfect solution for all-day-computing featuring a 14.1-inch display with 1024-by-786 pixels XGA resolution (M350C model) or a 15.4-inch Crisp and Bright Active Matrix Widescreen with 1280-by-800 pixels WXGA resolution (M375C model), an internal PC Video Camera for video conferencing, an integrated wireless LAN 802.11b (11 Mbps) and Bluetooth as well as up to 6 hours of battery life with optional high-capacity battery pack (two types of battery : 6 hour and 2 hour battery). Moreover, the Milano system sports an internal DVD-Burner (DVD-R/-RW) for mobile DVD-burning, hard drive up to 80 GB, memory up to 1 GB of DDR266/DDR333 DRAM, and a choice of optical drive: CD-ROM, CD-RW, DVD, DVD/CD-RW Combo or DVD Burner (DVD-R/-RW). The ports include: 2x USB 2.0/1.1; 1x mini-IEEE 1394 FireWire; 1x external CRT monitor port; 1x headphone jack; 1x microphone; 1x S/PDIF output jack; 1x TV-out jack; 1x RJ-11 for Modem; 1x RJ-45 jack for LAN; 1x DC-in jack. The slim and light Milano weights under 6 lbs / 2.5kg.